The Composite Squadron of the Waxhaws is run by a very competent staff composed of cadets and senior members. The cadet commander is selected by a board of senior members and the squadron commander, 1st Lt. Stevens. 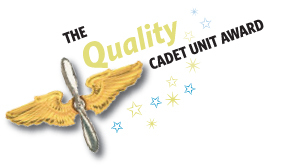 The cadet line staff, selected by the cadet commander, include a first sergeant, flight sergeants, and flight assistants. The support staff is choose by the cadet commander and cadet executive officer.